The last man to shoot an American president now spends most of the year in a house overlooking the 13th hole of a golf course in a gated community. He takes long walks along tree-lined paths, plays guitar and paints, grabs fast food at Wendy's. He drives around town in a silver Toyota Avalon, a car that wouldn't attract a second glance. Often, as if to avoid detection, he puts on a hat or visor before going out. These days, John Hinckley Jr. lives much of the year like any average Joe: shopping, eating out, watching movies at a local Regal Cinemas. 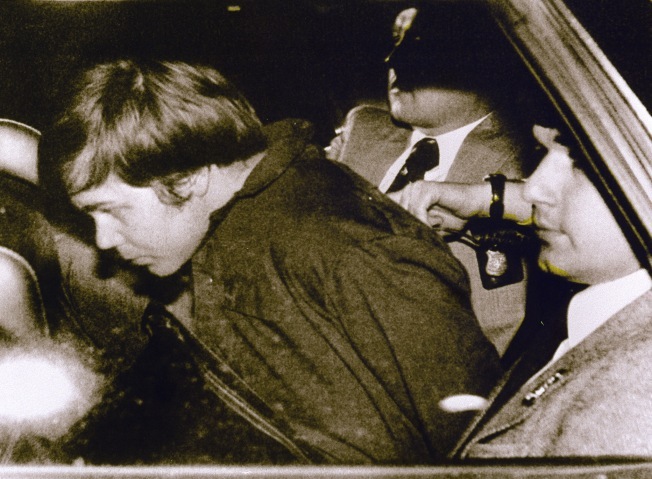 Hinckley was just 25 when he shot President Ronald Reagan and three others in 1981, and when jurors found him not guilty by reason of insanity they said he needed treatment, not a lifetime in confinement. The verdict left open the possibility that he would one day live outside a mental hospital. For the past year, under a judge's order, Hinckley has spent 17 days a month at his mother's home in Williamsburg, a small southeastern Virginia city known for its colonial roots. Freedom has come in stages and with strict requirements: meeting regularly while in town with both a psychiatrist and a therapist, getting a volunteer job. It has all been part of a lengthy process meant to reintegrate Hinckley, now nearing 60, back into society. On Wednesday, court hearings are set to begin on whether to expand Hinckley's time in Williamsburg further. His doctors' recommendation isn't yet public, but the latest plan could see him living here permanently. It's not unusual for most of the small number of defendants found not guilty by reason of insanity to ultimately return to a community. Still, in Hinckley's case, that leaves some in the place he'd call home wondering: Is he really ready for life on the outside? And are they really ready for him? "We can't prevent him from being here. He is still an American citizen," said Bryan J. Hill, administrator of James City County. On the job now for seven months, Hill was surprised when contacted by The Associated Press to learn that Hinckley is a frequent visitor. His name hasn't come up in meetings with public safety officials, although every time there's a hearing in Washington, D.C., about his potential release, it does make the local news. "I'm not saying that we should forgive or forget," Hill said. "We have to monitor, and hopefully it doesn't happen again." A two-and-a-half-hour drive south of Hinckley's institutional home of St. Elizabeths Hospital in the nation's capital, Williamsburg is both a tourist destination and a retirement mecca. It's home to the College of William and Mary and the Busch Gardens amusement park. Nearby is Colonial Williamsburg, where on a recent weekday visitors could catch a reading of the Declaration of Independence at 1 p.m. and see a military reenactment at 5. Residents call it small-town living, the kind of place where people wave at their neighbors. Whether it is also a place that will welcome a would-be assassin is less clear. Local real estate agent John Womeldorf, who calls himself "Mr. Williamsburg," always points out the street where Hinckley's mother lives if he's showing a house in the same resort community. He doesn't want new homeowners to be surprised after they've moved in. "I just matter-of-factly ask them 'Do you remember the guy that shot President Reagan?' And usually they do. And I say, 'Well his mother lives here and he gets released a number of times a year and comes and stays with his mom,'" Womeldorf said. The news has deterred maybe one or two buyers in the more than a decade he's been an agent in the community, he said. "It's been a non-issue." Not so for others here. Some have griped about Hinckley in the local paper, The Virginia Gazette, which has a section called "Last Word" containing anonymous comments about city life. Cabot Wade, a musician who once gave Hinckley guitar lessons and described his singing voice as Kenny Loggins-like, said he never personally felt that Hinckley was violent or dangerous. Nevertheless, he said, "Nobody will touch him with a 10-foot pole." Hinckley's doctors have said for years that he is no longer plagued by the mental illness that drove him to shoot Reagan outside a Washington hotel in an effort to impress actress Jodie Foster, whom he grew obsessed with after seeing her in the movie "Taxi Driver." Among those wounded was Press Secretary James Brady, who was shot in the head and left partially paralyzed. When Brady died last year, the Virginia medical examiner's office ruled his death a homicide, but prosecutors said legal barriers including the length of time between the crime and Brady's death prevented them from pursuing additional charges against Hinckley. In hearings before U.S. District Court Judge Paul L. Friedman, doctors have testified that Hinckley's original diagnosis — psychosis and major depression — has been in remission for decades and that while he still has a narcissistic personality disorder, its effects have diminished. He takes Zoloft for anxiety and, before bed, one milligram of the antipsychotic drug Risperdal. Psychological testing designed to predict violence shows Hinckley's dangerousness risk is "decidedly low," Hinckley's longtime lawyer, Barry Levine, said during the most recent set of hearings over his release that started in late 2011 and continued intermittently through 2013. "This man is not dangerous. The evidence shows that he is not dangerous," Levine told Friedman, who was assigned the case in 2001 after the previous judge overseeing it died. For decades, Hinckley spent all of his time at St. Elizabeths. Then, in 2003, Friedman ruled he could have day visits with his parents outside of the institution, followed by overnight visits within a 50-mile radius. Starting in 2006, Hinckley was allowed three-night trips to Williamsburg. Eventually that went to four nights, then more. In late 2013, the judge upped Hinckley's time to the current 17-day stretches. Friedman said he was persuaded that Hinckley was not a danger and that the longer duration might "provide new opportunities for employment and structured community activities." In new hearings set to begin Wednesday, St. Elizabeths and Levine are expected to urge the judge to give Hinckley even more freedom. That could mean 24 days a month, which was previously requested, or full-time, year-round "convalescent leave" in town. Prosecutors have consistently opposed Hinckley's release, arguing he has a history of deceptive behavior. They have pointed to a 1987 journal entry in which he claimed his psychiatrists would "never know the true John Hinckley." "Psychiatry is a guessing game and I do my best to keep the fools guessing about me," he wrote. Prosecutors have also said Hinckley's relationships with women remain troubling. They took issue with some of the romantic relationships he formed with a few patients at St. Elizabeths. He also once feigned a toothache to try to see his female dentist and looked up pictures of her on the Internet. More recently, they cited a July 2011 incident in which he was supposed to go see a movie in Williamsburg and instead went to a nearby Barnes & Noble. The Secret Service, whose agents sporadically tail Hinckley while he is in town, reported he was observed looking at shelves that contained several books about Reagan and the attempted assassination, though he didn't pick anything up. Hinckley then lied when he returned to St. Elizabeths, suggesting he'd seen "Captain America." A few months later he claimed he saw "Rise of the Planet of the Apes" when instead he ate at Quiznos and again went to the bookstore. "Mr. Hinckley has not shown himself ready to conduct the hard work of transitioning to a new city," prosecutor Sarah Chasson told the court in 2011. Experts not involved in Hinckley's case said that people like him can successfully transition back to a community and there are tools to evaluate whether they remain dangerous, though there are limits. Dr. Paul Appelbaum, a professor of psychiatry at Columbia University and a past president of the American Psychiatric Association, said those tools usually say more about groups than they do individuals: Men are more likely to be violent than women, young people are more likely to be violent than older people, people who abuse substances like alcohol are more likely to be violent. "No matter how well you know somebody, no matter the evaluation you do, there's some uncertainty" when such defendants are released, Appelbaum said. That's why the standard approach is to give someone like Hinckley freedom incrementally, with oversight by doctors, and see how they do. In Hinckley's case, Williamsburg was chosen as the place he could test his freedom because it was where his parents had made their home. Though Hinckley grew up in Texas, where his older brother and sister still live, his parents bought here in the 1980s. John Sr., a former oil executive, died in 2008, leaving only Hinckley's mother, Jo Ann. She lives in an unassuming home in the community of Kingsmill, which sits along the James River. The garage is painted a woodsy brown and rounded shrubs suggest a gardener has been by. Inside, Hinckley's room has a king-size bed and TV and is decorated with paintings he has done of houses and cats, according to a hospital report. Nearby homes are listed at around $400,000. Residents can play tennis or swim at three recreation centers. The adjoining Kingsmill Resort has a spa, a marina and three golf courses. President Bill Clinton played golf at Kingsmill in the 1990s. President Barack Obama has also been to the resort, staying in 2012 while preparing for a debate. Secret Service records suggest Hinckley wasn't in town when Obama stayed there. One of the many restrictions placed on Hinckley while in Williamsburg is to avoid traveling to Richmond or "areas where the President or members of Congress may be visiting." He can drive solo but only to go to places where "people will be expecting him." Talking to the media is a no-no. Weekly visits to his psychiatrist and therapist are a must. A court order permits two, two-hour walks daily. Hinckley also gets six unsupervised outings of up to four hours, and he has been required to create a detailed itinerary of what he will do. He is required to carry a GPS-enabled cellphone during all unsupervised activities. The aim of it all is to help Hinckley rebuild some semblance of a normal life: To hold a job, make friends, participate in activities with others. But his progress has been halting. Judge Friedman's latest opinion criticized Hinckley's "cookie-cutter" itineraries and his lack of participation in activities, noting he "has not made any friends in the community." The judge blamed a lack of aggressiveness by his case manager and "insufficient initiative" by Hinckley. "Mr. Hinckley is, by nature, an introverted person and prefers to engage in solitary pursuits; he therefore must be motivated to interact with others," the judge wrote. But Hinckley's notoriety has made that a challenge. Once, several years ago, when Hinckley's sister took him to a church meeting for singles, they were asked to leave because one group member felt uncomfortable. Another time, an artist who initially expressed a willingness to teach Hinckley turned him down. Hinckley's therapist, Dr. Carl Beffa, had a tough time finding him a volunteer job. A hospice where he thought Hinckley might play guitar had concerns about negative publicity. A cat rescue organization rejected his help because board members thought Hinckley would frighten away other volunteers. Beffa and others involved in Hinckley's care won't talk with reporters but have testified in court. Finally, the librarian at Eastern State Hospital, a facility for the mentally ill, agreed to take Hinckley on. "Not everyone was real happy about it," Sandra Kochersperger, who retired in 2013, said in an interview with the AP. Kochersperger worked with Hinckley for about three years, and said she found him "very quiet" and "kind of shy," ''considerate" and "very sweet." As a volunteer twice a week in the hospital's staff library, he made copies and shelved books. He sometimes talked about his love of playing guitar, writing music and painting. One week he brought Kochersperger one of his paintings, a vase of flowers done in broad messy brush strokes and vibrant colors — yellow, red, blue and purple — his name signed in cursive at the bottom left. They talked about movies, including the 2010 film "Shutter Island," about an asylum for the criminally insane. He talked about the feral cats he cares for at St. Elizabeths, and on occasion he mentioned girlfriends. Neither of them brought up his crime. Before she retired, Kochersperger made sure Hinckley had another volunteer position at the hospital, working at a patient cafe. "I think John's paid for what he did. He was in a totally different mind at that time. He was psychotic," she said. "I think he needs to be given the opportunity at this stage to try to have some kind of a life." Others are also accepting. Dewayne Tomlin, who has a barber shop near Kingsmill, said he isn't worried about Hinckley and would cut his hair "as long as he's got 13 dollars" to pay for the trim. Some residents said they wouldn't recognize Hinckley if they saw him. They remember only a boyish mugshot from the '80s. And a few younger people had no idea who he is. "Who?" said a 20-year-old hostess at The Sportsmans Grille, a bar where Hinckley had eaten just days earlier. A 24-year-old reading at the Barnes & Noble that Hinckley has visited didn't know Reagan had been shot. Then there are those unwilling to forgive, or forget. "I'd just as soon not have that whole business in my neighborhood," said Kingsmill resident Jim Shoemaker, 72, who has doubts about whether Hinckley really is, in fact, cured. "I don't trust the science," he said. Another Kingsmill resident, 73-year-old Joe Mann, said if it were up to him, he'd keep Hinckley confined, arguing that he doesn't need a gun to be dangerous. "All it takes is one slip, one flip of whatever in the brain caused him to do what he did before." Hinckley's attorney has said in court that those concerns are unfounded, and the sooner Hinckley makes Williamsburg his full-time home, the better. His elderly mother helps supervise him, and lawyers have discussed what might happen if she becomes incapacitated or dies. Hinckley's sister has testified that the family home would be sold but that Hinckley would want to remain in Williamsburg. "Time is not our friend. This thing has a growing urgency to it," Hinckley's attorney told the judge in November 2011, when the last hearing about Hinckley's freedom began. "The time," he said, "is now."